EVERYTHING A BEGINNER CALLIGRAPHER NEEDS TO KNOW TO GET STARTED WITH BEAUTIFUL HANDWRITING. The art of calligraphy doesn't teach you how to write words, but instead, how to draw them. 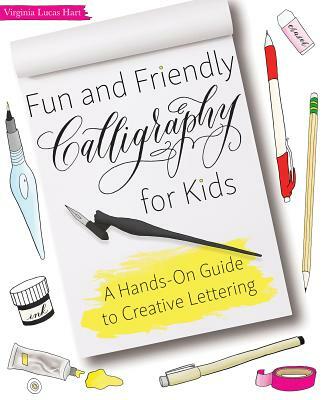 With this book's fun and playful approach, you will not only improve your handwriting skills, you'll have an absolute blast while doing so You'll learn everything from A>/i> to Z, including how to make letterforms, mix inks and develop a unique lettering style. - Fun logos & monograms. Virginia Lucas Hart is a calligrapher, illustrator, and designer based in New York City. She earned degrees in English and Studio Art from the University of Virginia and has received formal calligraphy training as a member of the International Association of Master Penmen, Engrossers and Teachers of Handwriting. Virginia teaches modern calligraphy to both adults and children, celebrating the beauty and importance of her students' individual styles. Virginia's calligraphy has been featured on NBC's .The Today Show, in BRIDES and Flutter magazines, and in several online publications. To learn more about Virginia and her work, please visit her website, virginialucashart.com.